Make sure you know what to expect in the housing market next year. If you're looking to sell your home, now's a pretty good time to be a seller. Relative strength in the housing market is a helpful trend, but you should also be aware of some other financial considerations that could have an impact on the best decision for you. Below, we'll look at some of the factors to take into account if you'll be selling a home in 2017. The housing bust happened nearly a decade ago, but the episode is still fresh in the minds of many homeowners who suffered through it. Even now, home prices haven't quite recovered all of their lost ground from the terrible years from 2007 to 2009, but they made more progress during 2016 toward moving back toward all-time highs. During the year, the Case-Shiller 20-City Composite Home Price Index climbed almost 4%, with the latest October reading of 190.45 resting less than 8% below the all-time record level in 2006. Of course, the particular place where your house is located has a huge impact on whether you're truly in a seller's market or whether conditions are more in balance. For instance, in San Francisco, price levels reached new record heights in late 2015 and have continued to climb through 2016. By contrast, Detroit remains well below its 2006 peak, even though its index level grew at a faster pace than the 20-city composite average during the year. On the other hand, low mortgage rates have been a big contributing factor in driving home affordability. In 2016, the mortgage market defied calls for higher rates, staying at rock-bottom levels until very late in the year. 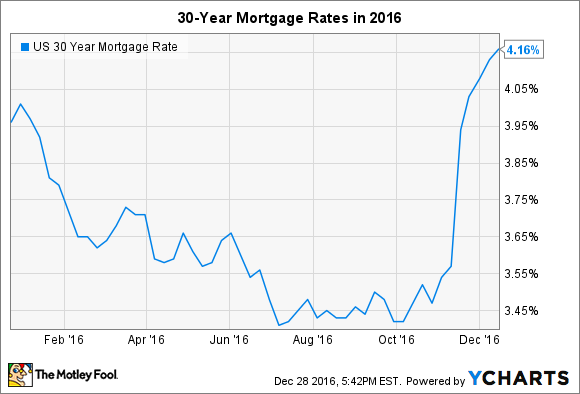 Only in the aftermath of the presidential election did mortgage rates climb to their highest levels of the year. That increase comes despite the fact that the Federal Reserve made only a single quarter-point boost in interest rates during 2016, and that came at its last opportunity in mid-December. However, the Fed signaled that two to three rate increases could be coming for 2017. That could play a role in keeping some marginal buyers out of the market, putting more pressure on sellers to lower prices in order to make their homes affordable. If you're listing a property, you should be aware that financing contingencies might be more likely to lead to aborted deals if you're working with financially strapped would-be buyers. Still, sellers can be happy that tax breaks are still available to buyers. Homeowners can typically claim deductions for mortgage interest and real estate taxes if they itemize, and although it hasn't yet been finalized, there's a possibility that provisions allowing for deduction of private mortgage insurance premiums will survive into 2017 as well. For sellers, though, the biggest tax break is the exclusion of capital gains when you sell your home. Exclusions of up to $250,000 in gains for single taxpayers and $500,000 for joint filers are available if the property is your main home and you've lived in it for 24 months out of the past five years. Partial exclusions are sometimes available if you don't fully meet these requirements or if you've claimed an exclusion for another property within the past two years. Be sure to consult your tax specialist for details on your situation. Will you have to pay a 6% commission? If you use a real estate agent to help you sell your home, the traditional practice has been that you can expect to pay a 6% commission on your sales proceeds. However, in recent years, some real estate brokers have negotiated lower commissions, and that trend continued in 2016. Indeed, even the National Association of Realtors has acknowledged that changing conditions are resulting in new pricing models. Those could bring the U.S. more in line with commission levels in other countries, which average closer to 1% to 3%. However, a lot depends on how healthy your local market is. If homes are regularly turning around in a matter of days rather than months, then it's easier to argue that a lower commission is warranted. In weaker markets where more marketing effort is necessary, the extra work will make it harder to expect commission cuts. If you're looking to sell your home in 2017, you need to be ready for the long and arduous process that's sometimes involved. By knowing what to expect, however, you'll be better able to get the deal you want.